This Access Excel tutorial explains how to assign number to Text for custom sorting sequence and how to use Excel Custom Lists. What if we need to sort by Finance > IT > HR? Apparently you cannot do that with descending order or ascending order, it is a custom order defined by yourself. 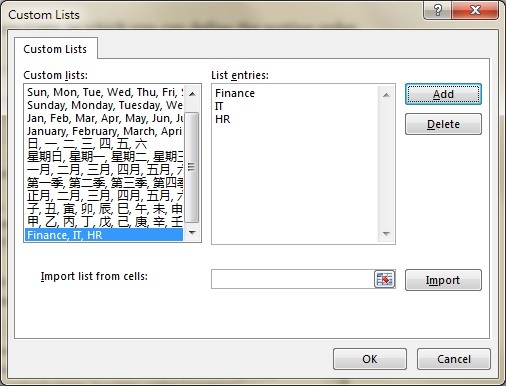 Excel has a built-in Function called Custom Lists, in which you can define the sorting order. In Excel 2013, navigate to File > Options > Advanced > click on Edit Custom Lists button. In List entries box, type the desired order, then press Add button. Then choose the Custom List under Order. Instead of sorting using Custom Lists, I prefer to assign a numerical value for each Text, it is more flexible when dealing with ascending order / descending order. I was inspired to make this Function because I needed a column to do sorting in Access Report, but Access does not have a Custom List as Excel does. Define your list of items in ascending order in line four of the code. This Function returns the order as defined in line four of the code, the first item in the list is assigned 0. Therefore “Finance” is assigned 0, “HR” is 1, “IT ” is 2. If Item is not found in the defined list, the Function returns 1000.